The Powerful Owl (Ninox strenua), one of Australia's iconic birds, is currently listed as vulnerable in NSW with only 20-30 mating pairs in the Sydney region. 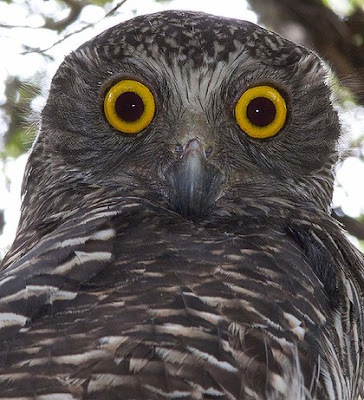 In response Birds Australia has put out a call to the general public to report sightings of the Powerful Owl. They are also giving people the opportunity to volunteer as trainer-observers and gather more detailed data. A large cause of the birds’ vulnerable status is land clearing of their natural habitat. In recent times the owls have been known to live in fragmented habitats such as farms and suburban areas - a significant change from open forest and woodland areas where the birds' main nesting location is inside tree hollows, a perfect space for females to incubate eggs and brood their young. The owl is the largest of Australia’s nocturnal birds: 50-60cm in size so when identifying the bird size is a definite factor to consider. The owl is prevalent in eastern and south-eastern Australia, mainly on the eastern side of the Great Dividing Range, from south-eastern QLD to VIC. The bird is a carnivore, commonly known to eat Ringtail Possums, Great Gliders and other tree-dwelling mammals, as well as rabbits and small marsupials. The bird catches prey with its feet. The bird can also be distinguished by its call: a deep, double hoot “woo-hoo”, with the males' call generally deeper than the females'. The Powerful Owl mates for life and defends an all-purpose territory. Breeding season is April to September, so in this time period it will be much more likely to sight the male bird.